"The big boulder -- actually only a few inches of it stuck above the surface of the ground, like the tip of some ancient igneous iceberg -- served as a natural centerpiece for the tiny cemetary. And on the edges of the top of the rock were carved a few of the names of the dogs sleeping alongside. The carving was not the neat, professional work found on gravestones. The letters slanted away at silly angles, almost as if a child painstakingly had etched in the letters with hammer and chisel. A workman on The Place had done it, perhaps, or the Master himself. "Wolf was one of the names on the boulder and Bob another. Scattered for a short distance around the rock were small, rectangular stone markers denoting still other graves. "Fair Ellen sleeps here. And there is Champion Sigurdson and over there Champion Explorer. And Champion Thane. 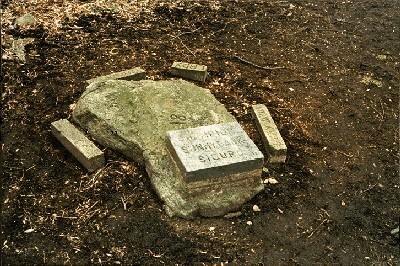 And there is the grave of Tippy, the Persian cat of the Mistress and the respected foe of so many of the collies. "The Visitor slowly read the names and then read them again. And the memories passed through his mind again as if a roster of great heroes was being called out, the names echoing across a parade ground with the flags snapping in the wind and the band playing proud martial airs. The names were to him like the names of great people in a dimly remembered history book; and they were, at the same time, like the names of the dearest friends of his boyhood, coming back to him now in a strange cloud of distant sorrow."